Molly Ivins made it possible for me to survive leaving Austin and Texas in some of the darkest, hardest, loneliest and most homesick days of my life. 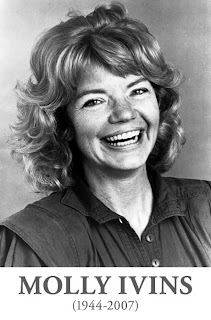 I took her first book with me, Molly Ivins Can't Say That, Can She?, and her words made me actually miss Texas politics, while I was laughing so hard about it my sides hurt and my eyes watered. I always meant to send the book back to Austin to ask her to sign it, after a newspaper article said she'd do so happily. Now I still have my memories of her, and her wonderful words. Maybe someday somebody will publish all those words in one set, so we can keep them forever. It's literature, pure and simple. I really didn't think it would bother me this much. But I'm gonna miss her. She's the one who taught me to tell people who asked how I was, "Fine as frog hair." And then grin, real big, the way you're supposed to. I am really gonna miss her. We all are. The AP "obituary" is here. This one is better. More as I find them. We are the people who run this country. We are the deciders. And every single day, every single one of us needs to step outside and take some action to help stop this war. Raise hell. Think of something to make the ridiculous look ridiculous. Make our troops know we're for them and trying to get them out of there. Hit the streets to protest Bush's proposed surge. If you can, go to the peace march in Washington on Jan. 27. We need people in the streets, banging pots and pans and demanding, "Stop it, now!" Can I get an "Amen!"? you have the ground sense necessary. I begin with a design for a hearse. nor white either — and not polished! a rough dray to drag over the ground. To keep the rain and snow from him? pebbles and dirt and what not. my townspeople, what are you thinking of? with gilt wheels and no top at all. especially no hot house flowers. even flowers if he had come to that. So much for the hearse. For heaven's sake though see to the driver! dragging our friend out to his own dignity! Bring him down—bring him down! to the weather as to grief. Or do you think you can shut grief in? I think you are ready. Too funny. When Atrios had this story up, they were "boxes of Doom" which perplexed everyone and seemed to be the work of pranksters. Turner Broadcasting, parent company of Cartoon Network, said the devices, which consisted of magnetic, blinking lights, were part of a promotion for the TV show "Aqua Teen Hunger Force." "The packages in question are magnetic lights that pose no danger," Turner said in a statement. It said the devices have been in place for two to three weeks in 10 cities: Boston, New York, Los Angeles, Chicago, Atlanta, Seattle, Portland, Ore., Austin, Texas, San Francisco and Philadelphia. "We regret that they were mistakenly thought to pose any danger," the company said. Police said only that they were investigating where the device came from. The Department of Homeland Security said there are no credible reports of other devices being found elsewhere in the country. It's the last bit that gets me. Turner says they've been up everywhere. DHS, those sterling promoters of fear and trembling, insist they have no "credible reports" that this is true. This probably means every executive of Turner Broadcasting and Time/Warner is now on a "no-fly" list, in perpetuity. Because, after all, just because a major corporation says it and that leaves egg all over the face of Boston police and the DHS, doesn't mean it's "credible." The show follows the misadventures of a carton of french fries, a milkshake and a wad of hamburger meat who live together in a run-down suburban house. A feature-length film version of the show is scheduled to come out in March. One more reason to go on living. And scoutprime has "the rest of the story." Remember, everyone, the rest of us aren't laughing at you; we're laughing near you. President Bush has signed a directive that gives the White House much greater control over the rules and policy statements that the government develops to protect public health, safety, the environment, civil rights and privacy. In an executive order published last week in the Federal Register, Mr. Bush said that each agency must have a regulatory policy office run by a political appointee, to supervise the development of rules and documents providing guidance to regulated industries. The White House will thus have a gatekeeper in each agency to analyze the costs and the benefits of new rules and to make sure the agencies carry out the president's priorities. In the fall of 2004, a team I led at NASA published a paper providing an explanation of how ozone depletion over Antarctica and increasing greenhouse gases could together account for this observed cooling of Antarctica. The study was the first to look at how these two factors work together to influence Antarctic temperatures. It not only helped to explain the observed cooling, but also predicted a warmer future for Antarctica based on projections of continued increases in greenhouse gases. This has clear implications both for the debate on global warming and for potential sea-level rise, as Antarctica contains an enormous reservoir of water in its ice sheets. The NASA press corps and I wrote a press release on these findings to convey them to the broader public. While previous to this time, press releases had been issued rapidly and with reservations from headquarters that basically were made to improve clarity and style, this release was repeatedly delayed, altered and eventually watered down. When we at GISS enquired of those higher up the NASA chain what was going on, we were told in the fall of 2004 [inaudible] that releases were being delayed because two political appointees and the White House were now reviewing all climate-related press releases. Scientists do not simply explore what we are most curious about. We know that our research is funded by the public, and we go to great lengths to provide policy-relevant information to support decision-making. While it was frustrating for me to see my work suppressed, even more importantly it’s a disservice to the public to distort or suppress information needed. But that experience is only one example of a series of actions that attempted to suppress communication of climate science to the public. Also during the fall of 2004, NASA headquarters insisted that a NASA press officer be present to monitor all interviews, either in person or on the phone, a measure most of us felt was unbefitting of a democratic society. As with the interference with press releases, the restrictions were not imposed on other parts of NASA, such as Space Science, or even other areas of Earth Science outside of climate research. Testimony of Dr. Drew Shindell, researcher at NASA’s Goddard Institute for Space Studies since 1995, before Rep. Henry Waxman's Committee on House Oversight and Government Reform Committee. Some cases challenging the program, which monitored international communications of people in the United States without court approval, have also involved atypical maneuvering. Soon after one suit challenging the program was filed last year in Oregon, Justice Department lawyers threatened to seize an exhibit from the court file. This month, in the same case, the department sought to inspect and delete files from the computers on which lawyers for the plaintiffs had prepared their legal filings. The tactics, said a lawyer in the Oregon case, Jon B. Eisenberg, prompted him to conduct unusual research. A federal district judge in the case, Garr M. King, invoked another book after a government lawyer refused to disclose whether he had a certain security clearance, saying information about the clearance was itself classified. In ordinary civil suits, the parties’ submissions are sent to their adversaries and are available to the public in open court files. But in several cases challenging the eavesdropping, Justice Department lawyers have been submitting legal papers not by filing them in court but by placing them in a room at the department. They have filed papers, in other words, with themselves. At the meeting this month, judges on the United States Court of Appeals for the Sixth Circuit asked how the procedures might affect the integrity of the files and the appellate records. There are serious questions of separation of powers at work here. Ordinarily, all documents are held by the court, so no one can question their accessibility. “The ([Sixth Circuit} court raised questions about the procedures the government had used to file classified submissions in the case and the propriety and integrity of those procedures,” said Ms. Beeson, associate legal director of the A.C.L.U., which represents the plaintiffs in the appeal. “They were also concerned about the independence of the judiciary,” given that “the Justice Department retains custody and total control over the court filings.” Ms. Beeson said. And then there's the case of the document the government decided had to be retrieved even from the court record. They were sending the FBI to purge the record when the judge in the case stopped them. Oh, just read the article. This whole matter gives a new meaning to "Kafkaesque." A group of nuns were last night holed up behind the protective walls of the Xenia monastery in the central Greek town of Volos after fleeing their convent when their knitting business failed, leaving nearly half a millon pounds of debt. Ignoring pleas and protests to return to the fold from Archbishop Christodoulos, the country's fiery spiritual leader, the order's mother superior signalled that the nuns would be staying put, despite mounting consternation from a number of banks. Yesterday her stance sparked a mini-crisis for the Greek Orthodox church, which, after convening bishops and other top clerics, described the incident as "a first" for the church. The order, whose 55 members have been described as a "feisty crowd", are believed to have run up the debt after splashing out on six industrial knitting machines to produce woollens that became highly popular with the local community around their convent, close to the Greek-Bulgarian border. They apparently sold products to some 25 chains around Greece. Store owners complained that the nuns had also run off with a substantial amount in pocketed deposits. Apparently they removed their equipment a few days before they disappeared. Greece's authoritative Kathimerini newspaper reported that the knitting business began to unravel when the nuns accrued massive debts after attending foreign fashion shows in a bid to keep up with the latest designs in woollen garments. They are then believed to have mortgaged the monastery of Kyrikos and Ioulittis to the hilt to pay off the debt. With the banks demanding the money back, Greece's holy synod says it is confronting one of its worst crises ever involving an order of nuns. The 'gospel of wealth' sometimes requires an MBA on the side. I guess. Praise be unto the only God. In the name of God, the Compassionate, the Merciful. O ye Moslems. O ye beloved sons of the Maghreb. May the blessing of God be upon you. This is a great day for you and us, for all the sons of Adam who love freedom. Our numbers are as the leaves on the forest tress and as the grains of sand in the sea. Behold. We the American Holy Warriors have arrived. We have come here to fight the great Jihad of Freedom. We have come to set you free. We have sailed across the great sea in many ships, on many beaches we are landing, and our fighters swarm across the sands and into the city streets, and into the wide country sides, and along the highways. Light fires on the hilltops; shout from your housetops, and from the high places, and say the sound of the drum be heard in the land, and the ululation of the women, and the voices even of small children. Assemble along the highways to welcome your brothers. We have come to set you free. Speak with our fighting men and you will find them pleasing to the eye and gladdening to the heart. We are not as some other Christians whom ye have known, and who trample you under foot. Our soldiers consider you as their brothers, for we have been reared in the way of free men. Our soldiers have been told about your country and about their Moslem brothers and they will treat you with respect and with a friendly spirit in the eyes of God. Look in their eyes and smiling faces, for they are Holy Warriors happy in their holy work. Greet us therefore as brothers as we will greet you, and help us. If we are thirsty, show us the way to water. If we lose our way, lead us back to our camping places. Show us the paths over the mountains if need be, and if you see our enemies, the Germans or Italians, making trouble for us, kill them with knives or with stones or with any other weapon that you may have set your hands upon. Help us as we have come to help you, and rich will be the reward unto us all who love justice and righteousness and freedom. Pray for our success in battle, and help us, and God will help us both. Lo, the day of freedom hath come. May God grant his blessing upon you and upon us. That's Franklin D., by the way. October 1942 was the moment when British forces stopped Hitler’s Afrika Korps at El Alamein; for the first time in two years, the Allies felt confident that they would keep the Germans out of the Middle East, and they sought to take advantage of this change in fortune to win Muslim favor. Roosevelt’s appeal was part of this effort. Combine that with this much more interesting interview on NPR yesterday with the author of Power, Faith, and Fantasy: America in the Middle East: 1776 to the Present, in which we learn, among other things, that Arab nationalism which so plagues US foreign policy today is a direct result of American Universities being established in the "Middle East" for the purpose of inculcating "Western values" among the people there. What's that line about being careful what you wish for? So, we didn't always consider the "Arabs" as radical dangerous "Muslims" who would like to kill us all. Once in a while, we've actually respected their culture. Which to choose, O, which to choose? The US must draw up plans to deal with an all-out Iraqi civil war that would kill hundreds of thousands, create millions of refugees, and could spill over into a regional catastrophe, disrupting oil supplies and setting up a direct confrontation between Washington and Iran. This is the central recommendation of a study by the Brookings Institution here, based on the assumption that President Bush's last-ditch troop increase fails to stabilise the country - but also on the reality that Washington cannot simply walk away from the growing disaster unleashed by the 2003 invasion. Even the US staying to try to contain the fighting, said Kenneth Pollack, one of the report's authors, "would consign Iraqis to a terrible fate. Even if it works, we will have failed to provide the Iraqis with the better future we promised." But it was the "least bad option" open to the US to protect its national interests in the event of full-scale civil war. US troops, says the study, should withdraw from Iraqi cities. This was "the only rational course of action, horrific though it will be", as America refocused its efforts from preventing civil war to containing its effects. my name is Specialist Ryan Schmidt (sp) from Forest Lake, Minnesota, and my question for you, Mr. President, is what if your plan for a troop surge to Baghdad does not work?" What do you think? PRESIDENT BUSH: Well, I would say to Ryan, I put it in place on the advice of a lot of smart people, particularly the military people who think it will work, and let us go into this aspect of the Iraqi strategy feeling it will work. But I will also assure Ryan that we're constantly adjusting to conditions on the ground. MR. WILLIAMS: Let's talk about Iran for a second, Mr. President. I mean, after a blitheringly bizarre statement like that, what could be a more natural follow up? MR. WILLIAMS: Well, another question about Vice President Cheney – he said last week that – here I'm quoting – "we've encountered enormous successes and we continue to have enormous successes in Iraq." Two weeks ago you said, quote, "there hadn't been enough success in Iraq." So it sounds like there's a conflicting message there. PRESIDENT BUSH: Oh, I don't think so. I think that the vice president is a person reflecting a half-glass-full mentality, and that is he's been able to look at – as have I, and I hope other Americans have – the fact that the tyrant was removed, 12 million people voted, there is an Iraqi constitution in place that is a model for – and unique for the Middle East. I will tell you, 2005 was a great year for freedom, and then the enemy took a good look and said, what do we need to do to stop the advance of freedom, and 2006 was a tough year. And I have said that the progress is not good enough. In other words, people have asked me about whether or not I approve of the situation in Iraq and my answer is no. We can do better, but it's going to require an Iraqi government that does several things. One is provide security for its people, and therefore it's in our interest to train with them, to embed with them, and to fight alongside them for a period of time until Baghdad is secure. Two, they've got to reconcile. In other words, they've got to make it clear to the 12 million people that made a conscious decision to vote and say, we want a unity government, to reach out to disparate elements. They've got to make sure that oil revenue, for example, is available to all of the people and not just a faction that may happen to be in power. They've got to make sure that those who were involved with the Saddam government in the past, so long as they weren't killers or terrorists, have a chance, for example, to be reinstated as school teachers. MR. WILLIAMS: All right. You know, people are praying for you; people – the American people want to be with you, Mr. President, but you just spoke about the polls and they indicate the public – and you know about what's going up on Capitol Hill with the Congress, some in the military. Even many Iraqis, according to the polls, don't like the idea of sending more troops into Iraq. So I wonder if you could give us something to go on, give us something – say, you know, this is a reason to get behind the president right now. The unremittingly bleak document, drawing on the experience of civil wars in Lebanon, the former Yugoslavia, Congo and Afghanistan, also offers a remarkably stark assessment of Iraq's "spill-over" potential across the Persian Gulf region. It warns of radicalisation and possible secession movements in adjacent countries, an upsurge in terrorism, and of intervention by Iran, Turkey and Saudi Arabia. Ending an all-out civil war, the report says, would require a force of 450,000 - three times the present US deployment even after the 21,500 "surge" ordered by President Bush this month. Everywhere looms the shadow of Iran. In a "war game" testing US options, the Saban Centre for Middle East Policy at the Brookings Institution found that, as the descent into civil war gathered pace, confrontation between the US and Iran intensified, and Washington's leverage on Tehran diminished. Civil war in Iraq would turn Iran into "the unambiguous adversary" of the US. Indeed, everything indicates that that is already happening. The study appeared on the same day as the Iranian ambassador in Iraq told The New York Times that Tehran intended to expand its influence in Iraq. US commanders now claim that thousands of Iranian advisers are arming and training Shia militias. Nonetheless, the Brookings report urges the creation of a regional group to help contain a civil war. That would see exactly the contacts with Iran and Syria that the Bush administration steadfastly refuses. An alternative in the report would be "red lines" which, if crossed by Tehran, could lead to a military attack by the US on Iran. Yeah, because everyone knows, when violence doesn't work, more violence is precisely what's called for. Maybe we still haven't let go of the stereotypes of Muslims left over from the Crusades. Or maybe this is the way the world ends. Not with a bang, but a belligerent whimper. Over the course of three days spent with the 105 soldiers here — Company C of the Second Battalion, 12th Cavalry — four American vehicles were hit by roadside bombs near the outpost. No soldiers from Company C were wounded, but they know the fighting will intensify. “I’m a juicy target they are just trying to figure out,” said Capt. Erik Peterson, 29, the commander at the outpost. The phrase has become positively Orwellian, and positively irrefutable. In the name of supporting our troops, we must make targets of our troops. To fail to continue to do so, is to undermine the morale of our troops. Vietnam. On steroids. So long as "victory is at hand," we must support our troops by feeding them to the slaughter. Because the only altenrative is to "cut 'n' run," and that would mean abandoning the chance to win. Does no one else remember that Vietnam was a civil war, too? When do we finally acknowledge that we just love setting up those juicy targets? Or is that the reality humankind cannot bear very much of? But what do we mean when we say....? Since you are so eager for spiritual gifts, strive to excel in them for building up the church. Therefore, one who speaks in a tongue should pray for the power to interpret. For if I pray in a tongue, my spirit prays but my mind is unproductive. What should I do then? I will pray with the spirit, but I will pray with the mind also; I will sing praise with the spirit, but I will sing praise with the mind also. Otherwise, if you say a blessing with the spirit, how can anyone in the position of an outsider say the "Amen" to your thanksgiving, since the outsider does not know what you are saying? For you may give thanks well enough, but the other person is not built up. I thank God that I speak in tongues more than all of you; nevertheless, in church I would rather speak five words with my mind, in order to instruct others alos, than ten thousand words in a tongue. Brothers and sisters, do not be children in your thinking; rather be infants in evil, but in thinking be adults. Seems we are still on that subject: the "building up of the church." First, let's note that "faith" in the New Testament is actually the word "trust." The Greek word is "pistis." It's primary meanings are: (1) that which causes trust and faith; (b) solemn promise; oath; trust (c) proof, pledge (2) trust, confidence, faith. We have layered it over with so many centuries of lamination that it is sometimes useful to strip away the varnish and see the word clearly again. "Faith" does not mean "irrational belief in an invisible sky being on no basis except fear and projected desires for an uber-parent." It means trust. And trust, ultimately, means acting in spite of vulnerability. It means, too, that we need each other. Look again at what Paul says: "For if I pray in a tongue, my spirit prays but my mind is unproductive. What should I do then? I will pray with the spirit, but I will pray with my mind also; I will sing praise with the spirit, but I will sing praise with the mind also. Otherwise, if you say a blessing with the spirit, how can anyone in the posiiton of an outsider say the 'Amen' to your thanksgiving, since the outsider does not know what you are saying?" My immediate thought, on hearing that yesterday, was that Paul was talking about our theological discussion. Theology, we like to say, engages only the head. But if it doesn't engage the spirit also, of what use is it? Kathleen Norris has excoriated theologians in her books, for what are usually very good reasons. Theologians, like all professions, develop their own jargon, and all too quickly, like all professions, they become another conspiracy against the laity. Surely that was the purpose of the Reformation, to end the divide between cleric and lay. And yet we have built it back up again. Who is there to save us from this miserable fate? Now, of course, it is theology which divides us again. Theology tells us homosexuals and perhaps even women cannot offer the sacramental presence to others. Theology is our excuse, our scapegoat. It isn't that we hate gays ("Not that there's anything wrong with that!" ); it's that our theology tells us we cannot allow them into the priesthood. Don't blame us; but we must preserve our theology. Alternatively, it is our theology which tells us we must allow gays and lesbians and women to be priests, that this fulfills the vision of the basiliea tou theou, of the basiliea tou ouranon. And when theology fails to provide us a definitive answer, fails to give us salvation from ourselves, from our own fears of the other, we blame theology for being impractical, for not being our saviour. And then we say that our group, alone, has the gifts which build up the church, because our theology tells us which is the proper church to be built up, and everyone prays for the power to interpret, but we make sure that power is interpreted to interpret only what we have already concluded is true. Because truth is so much easier to rely on than trust. Truth can be verified; trust must be taken on faith. And there we are: vulnerable again. "Covenant" is another tough word. My seminary professors were anxious to remove it from any legal context, lest we confuse it with "contract." It was a wise distinction. A contract is a promise binding on the parties to it, one sealed by the offering of consideration, othe giving up of some small thing by the person accepting the contract in response to the offer made by the other party, who is bound to the contract once the consideration proferred in response is accepted. But that's how the law finds a contract exists, not how the law interprets the concept of contract in all its manifestations. The difference is that contracts can be broken, and are merely business arrangements, creations of law. Covenants were creations of law, too; but that word has taken on meanings which are supposed to transcend the limitations of contract law. A contract, after all, is enforceable against both parties, but only by a third party. You cannot enter into a contract with one other person on a desert island, unless there is a third party on the island who can enforce the terms of the contract against both of you. In a covenant, both parties agree to be bound by the terms of the arrangement, and both parties can be held accountable to their agreement: but only by each other. One party, also, cannot walk away from the agreement. It is binding, and both parties remain bound to it. That, at least, is the cosmological thinking that tries to explain the covenant between the God of Abraham and human beings, whether it is the covenant with the descendants of Abraham, or the "new covenant" established between the Risen Lord and all believers. Covenant is a very charged word, but again, it includes a necessary element of vulnerability. When God called Abraham to walk before God and be righteous, and promised Abram land of his own, and descendants as numerous as the stars in the sky, Abram had no basis on which to believe God would do these things. Abraham was called to act only on trust. He could not act on past experience, on knowledge that the things God promised were true and could be trusted. Abraham could not even act on the promise that what was promised would come true in his lifetime. God said Abraham would be blessed, and through him all the nations of the world would be blessed; but that couldn't possibly come true in Abraham's lifetime. And yet Abraham believed. Everything, you see, begins with Abraham. And it all begins with trust, when you have no basis upon which to make trust. Paul is making essentially the same offer to the church in Corinth. "Srive to excel in them for building up the church." He knows we are selfish creatures, that we want something because there is something for us in it, and we, unlike Abraham, want the results right now. But Paul directs us outward, through ourselves toward the other. "...if you say a blessing with the spirit, how can anyone in the position of an outsider say the 'Amen' to your thanksgiving, since the outsider does not know what you are saying?" This is the challenge to theologians, to explain themselves clearly. This is the challenge to all members of the church, cleric as well as laity, to speak from the spirit, but speak clearly. The spirit may be personal, or even transcendent; but if you do not speak through the mind, how am I to know what you are saying? What good is it to me, to the body of Christ, the church? This is a challenge to everyone, even to the Philip Jenkins' of the church, who champion a "conservative" over a "liberal" theology (there is much more to be said on this topic). But it is a challenge to liberals, too. Is the church about to die if it does not change? Perhaps in post-Enlightenment Western European culture, it is; but that is not so obvious as it might seem. Is the church only the church in European culture? What then of the Orthodox? Of the Copts? Of the Church in Africa? Conversely, is the church only the church when it is "traditional"? But tradition, and my tradition? Hang it all, there can only be one "tradition"! Right? What should I do then? I will pray with the spirit, but I will pray with the mind also; I will sing praise with the spirit, but I will sing praise with the mind also. Otherwise, if you say a blessing with the spirit, how can anyone in the position of an outsider say the "Amen" to your thanksgiving, since the outsider does not know what you are saying? For you may give thanks well enough, but the other person is not built up. What should I do then? What would build up the church? And what would tear it down? Paul addresses that, in his letter to the Corinthians. Clearly what they are doing he thinks is tearing the church down; and he reminds them their focus should not be on them, but on the other, on the person "in the position of an outsider." Who can be anyone who is not you. That is the person you have to be concerned about. Even your thanksgiving to God should be given so that the outsider can say "Amen." Even your thanksgiving to God is not for your benefit, but so that someone else can join in. It comes from God; it goes to God; but it goes through you. A grave responsibility, indeed. Enough to make you tremble. One doesn't know why one trembles. This limit to knowledge no longer only relates to the cause or unknown event, the unseen or unknown that makes us tremble. Neither do we know why it produces this particular symptom, a certain irrepressible agitation of the body, the uncontrollable instability of its members or of the substance of the skin or muscles. Why does the irrepressible take this form? Why does terror make us tremble, since one can also tremble with mind, and such analogous physiological manifestations translate experiences and sentiments that appear, at least, not to have anything in common? This symptomatology is as enigmatic as tears. But thus does the Spirit speak to us; with sighs too deep for words, with trembling that reaches down to the very core of our being; with thoughts that must be pressed through mind in order that others might hear and say: "Amen." Let the reader understand. He who has ears, should listen. The economic rationale for Mr. Bush’s proposal is that too many people have “gold-plated, deluxe” health insurance, which encourages them to use excessive amounts of health care, driving up costs for everyone. Katherine Baicker, a member of the president’s Council of Economic Advisers, said the proposal would increase taxes for 30 million people with the most generous employer-provided health benefits, unless they “change their behavior” and choose less costly coverage. Ms. Baicker said the proposal would cut taxes for more than 100 million people who bought insurance on their own or had employee health benefits worth less than the standard deduction. First, Mr. Josten said, the $15,000 cap on tax-free insurance takes no account of wide geographic variation in the cost of health care and insurance. The same package of benefits typically costs more in Boston than in Minneapolis, for example. Moreover, Mr. Josten said, a health plan may be expensive because it covers older workers with major medical problems, not because it is “gold-plated.” A single mother, working as a low-paid secretary at a law firm, could be pushed into a higher tax bracket because she participates in an $18,000 health plan covering older men who have had heart attacks and expensive surgery, Mr. Josten said. Treasury officials acknowledged that some people with costly, comprehensive benefits had modest incomes. But deluxe health plans are vanishing fast. In recent years, many workers have found themselves paying more for less comprehensive benefits. From 2000 to 2006, premiums for employer-sponsored coverage rose 87 percent, about four times as fast as workers’ earnings, according to the Kaiser Family Foundation. The large print giveth, and the small print taketh away. Can we just say Gary Wills is absolutely right? When Abraham Lincoln took actions based on military considerations, he gave himself the proper title, “commander in chief of the Army and Navy of the United States.” That title is rarely — more like never — heard today. It is just “commander in chief,” or even “commander in chief of the United States.” This reflects the increasing militarization of our politics. The citizenry at large is now thought of as under military discipline. In wartime, it is true, people submit to the national leadership more than in peacetime. The executive branch takes actions in secret, unaccountable to the electorate, to hide its moves from the enemy and protect national secrets. Constitutional shortcuts are taken “for the duration.” But those impositions are removed when normal life returns. But we have not seen normal life in 66 years. The wartime discipline imposed in 1941 has never been lifted, and “the duration” has become the norm. World War II melded into the cold war, with greater secrecy than ever — more classified information, tougher security clearances. And now the cold war has modulated into the war on terrorism. I was watching, of all things, "Them" the other night. It's a classic post-WWII/Cold War film, of course, but in ways I'd never realized before. James Whitmore slides easily from Police Sgt. in New Mexico to FBI Agent James Arness's sidekick investigating giant ant sightings around the country, to man in /armny uniform with a flamethrower saving two kids in the LA storm sewer system. What struck me was how readily this was accepted, because clearly a man in 1954 would have served in the US military and so would fit in with military command again (of course, the idea that all police/military structures are one is another concomitant, as Mr. Wills points out, of WWII; and of the "militarization of politics" that Eisenhower also warned us against.) The "lesson" of WWII, it becomes more and more clear, is that America is now "Fortress America," constantly under seige and threat, and like Rome under Julius Caesar, we need a permanent diktator with all military and civil authority in order to protect the empire. I don't think that position, and the consequences of the "military industrial complex" Eisenhower warned against, are fully appreciated even today. It is significant that the Presidents who knew war and the military (Washington, Eisenhower) who get mentioned in Mr. Wills' column, also understood the importance of the Constitutional limits on the military. It is civilian Presidents (Reagan and W.) who erode those distinctions at the republic's peril. Mr. Wills draws the right conclusion, which is the danger this militarization represents to democracy (a danger Washington and Eisenhower understood). One thing I feel constrained to point out is that the intelligence apparatus which gave rise and credence to the Bush/Cheney defense "If you knew what we know, you would see how justified all our actions are," started under Harry Truman. or, How Dare You Stop Clapping for Tinkerbelle? LIEBERMAN: I fear that while this resolution is non-binding and, therefore, will not affect the implementation of the plan, it will do two things that can be harmful, which is that it will discourage our troops, who we’re asking to carry out this new plan, and it will encourage the enemy, because as General Petraeus said to our committee, war is a test of wills, and you don’t want your enemy to be given any hope. BROWNBACK: I don’t — I don’t see this enemy as needing any more emboldening or getting it from any resolution. They’re emboldened now. I was there two weeks ago in Iraq. I was in Baghdad. I was in northern Iraq. This is a very aggressive situation. You have sectarian violence of Sunni and Shia. I was in the Kurdish area. They were talking about we have to get the Sunni and Shia together. I talked with the head of the Kurdish group. He said he wouldn’t vote for more troops because you have to first force the Sunni and Shia to sit down and talk about a political accommodation and that’s not happening. The Senate Foreign Relations Committee chairman on Sunday dismissed criticism that a resolution opposing a troop buildup in Iraq would embolden the enemy and estimated perhaps only 20 senators believe President Bush "is headed in the right direction." "It's not the American people or the U.S. Congress who are emboldening the enemy," said Democratic Sen. Joe Biden, a White House hopeful in 2008. "It's the failed policy of this president — going to war without a strategy, going to war prematurely." That intensity was on display last Wednesday as he sat and stewed at a hearing of the Senate Foreign Relations Committee. The panel was considering a resolution condemning President Bush's proposal to send 21,000 additional troops to Iraq; Hagel, a cosponsor of the resolution, would be the only Republican on the committee to vote for its passage. As he listened to his colleagues make their cases for and against the president's plan, Hagel told NEWSWEEK he noticed something missing: an acknowledgment that the Senate was talking about committing real troops, the men and women whose "fighting and dying" make a war. He had no prepared text but the words came easily as he took his turn at the mike. Calling Iraq the country's most divisive issue since Vietnam, he dared his fellow committee members to take a stand. "I think all 100 senators ought to be on the line on this," he said. "If you wanted a safe job, go sell shoes." For a moment, his colleagues were silent and stunned. Later that afternoon, Joe Biden, the committee's Democratic chairman, complimented him on his performance. "I've rarely seen such a powerful connection between the heart and the mind," Biden said. "That was deep in you." Never having covered a civil war before, I learned about it together with my Iraqi friends. It is a bit like watching a slow-motion train wreck. Broken bodies fly past. Faces freeze in one’s memory in the moments before impact. Passengers grab handles and doorframes that simply tear off or uselessly collapse. I learned how much violence changes people, and how trust is chipped away, leaving society a thin layer of moth-eaten fabric that tears easily. It has unraveled so quickly. A year ago, my interviews were peppered with phrases like “Iraqis are all brothers.” The subjects would get angry when you asked their sect. Now some of them introduce themselves that way. I met Raad Jassim, a 38-year-old Shiite refugee, in a largely empty house, recently owned by Sunnis, where he now lives in western Baghdad. He moved there in the fall, after Sunni militants killed his brother and his nephew and confiscated his large chicken farm north of Baghdad. He had lived with Sunnis his whole life, but after what happened, a hatred spread through him like a disease. In another measure of just how much things have changed, Mr. Jassim’s Shiite neighborhood is relatively safe. The area is now largely free of Sunnis, after Shiite militias swept it last year, and it runs smoothly on a complex network of relationships among the local militias, the police and a powerful local council. His street is dotted with fruit stands. Boys in uniforms roughhouse. Men sit in teahouses sipping from tiny glass cups. Just to the south, the Sunni neighborhood of Dawoodi is ghostly at almost any time of day. Wide boulevards trimmed with palm trees used to connect luxury homes. Now giant piles of trash go uncollected in the median. A serious problem is dead bodies. They began to appear several times a week last summer on the railroad tracks that run through the neighborhood. But when residents call the police to pick up the bodies, they do not come. The police are Shiite and afraid of the area. “Entering a Sunni area for them is a risk,” said Yasir, a 40-year-old Sunni whose house is close to the dumping ground. The moderates are mostly gone. My phone includes at least a dozen entries for middle-class families who have given up and moved away. They were supposed to build democracy here. Instead they work odd jobs in Syria and Jordan. Even the moderate political leaders have left. I have three numbers for Adnan Pachachi, the distinguished Iraqi statesman; none have Iraqi country codes. The frank remark spoke of a new power balance, in which radicals rule and moderates have no voice. For many families I have become attached to here, the country is no longer recognizable. I met Haifa and her husband, Hassan, both teachers, in a driveway in western Baghdad. They had just found the body of their 12-year-old son, who had been kidnapped and brutally killed, and were frantic with grief. They finally decided to leave Iraq, but its violence tormented them to the end. They paid a man to drive them to Jordan, but he was working with Sunni militants in western Iraq, and pointed out Hassan, a Shiite, to a Sunni gang that stopped the car. Over the next several hours, Haifa waved a tiny Koran at men in masks, pleading for her husband’s release, her two remaining children in tow. Hassan, meanwhile, knelt in a small room, his hands behind his back. His captors shot a man next to him in the neck. Haifa, a Sunni, eventually prevailed on them to let him go. The family returned to Baghdad, then borrowed money to fly to Jordan. Now they live there, in a tiny basement apartment without windows in a white stone housing project on the side of a hill. Like many Iraqis there, they live in hiding. Residency permits cost $100,000, far beyond their means. Hassan cannot work, nor even risk leaving the house during the day for fear the Jordanian police will deport him. He tries not to talk to people, afraid someone will recognize his Iraqi accent. He doesn’t bargain in the vegetable market. He accepts mean remarks by Jordanian cabdrivers wordlessly. Averring that it will somehow, someday, all be worth it, is a frank example of hope over reality, and of the living over the dead. Tolstoy noted in "The Death of Ivan Ilyich" how all of Ivan's friends, upon learning of his demise in the publish obituary, all stopped for a moment and thought to themselves: "At least it isn't me." That's a very human reaction to another's death; but it's not at all a noble one. John Donne taught us the proper Christian response to death: "Therefore do no send to ask for whom the bell tolls; it tolls for thee." And so we still mourn the dead, as Christians, even as we proclaim the resurrection and eternal life. To say violence is ever "worth it"? Hmmmmm....a claim only the living can make. Do we embolden the enemy by facing reality? Or do we embolden them by continuing to make foolish sacrifices of other mother's children? Somebody want to ask Cindy Sheehan or the other Gold Star Mothers their opinions? Or are they unimportant because they are not Washington power brokers? Why do those who have no dead to mourn get preferment over the mourners? Because mourning is so emotional, and reason is superior to feeling? Or because real men know how to handle these problems, and the mocking of weakness that begins on the playground is never finally put aside from male thinking? Embiggening the enemy? No. Diminishing ourselves. To the size of children; children afraid of being called names. Public fatigue over the war in the Iraq is not reflected solely in the president's numbers, however. Congress is criticized by nearly two-thirds (64 percent) of Americans for not being assertive enough in challenging the Bush administration's conduct of the war. Even a third (31 percent) of rank-and-file Republicans say the previous Congress, controlled by their party, didn't do enough to challenge the administration on the war. Almost 40 years since President Richard Nixon first said it, there is a new "great, silent majority" of Americans. This time, however, the silent types aren't supporting the president, and they aren't in favor of the war. A recent Washington Post-ABC News poll showed that 65 percent of Americans oppose sending more troops to Iraq, 59 percent would support an attempt by Congress to block a troop surge and 52 percent are ready to leave before the situation stabilizes. Almost two-thirds now say the invasion was a mistake, the highest that number has been since the war began. So where are the riots? The marches? The sit-ins? The arrests? I thin it is 1972 all over again, but for the politicians, not for the people. There are still two lingering myths about Vietnam. One is that support for the troops failed, which somehow ruined our fighting resolve, which destroyed troop morale, which led us to catastrophic failure. Cheney likes to nutshell that now as "not having the stomach for [a fight]," more than slightly ironic considering the number of deferrals he got from the Vietnam draft. This is the myth in "Rambo II: First Blood" which keeps replaying on cable lately. Rambo tells somebody, in Stallone-speak: "We just want our country to love us as much as we love it!" It's a made up notion of why we lost, along with the non-existent soldiers who were spat on. The riots were mostly about race, not war. The demonstrations were about youth power, and mostly carried out by privileged college students who didn't like the idea of being drafted, or being told what to do, period. It had less to do with the war, actually, than with adolescent angst. I'm not being disparaging, just honest. Vietnam ended because people were spent, and frustrated, and fed up. Not because of Abbie Hoffman. The politicians are so far behind the people they can't even see the parade anymore. Another two years, and they will catch up. By being replaced. The energy now is with Webb and Pelosi and Murtha and even Kennedy. But don't expect Biden and Schumer and even Obama and Clinton to figure that out. They are, all of them, already behind the crest of history's wave. The news just hasn't gotten to them yet. So how is today like '72? Because the politicians still hear the roaring in their ears of the Nixon landslide. McGovern was crushed because he wanted to end the war. He was considered "weak", and that was disaster. Nixon had a "secret plan" to end the war, so ending the war wasn't the issue; how it ended was what mattered. "Peace with honor," "peace with dignity," that was the ideal. What we got, of course, were helicopters lifting off from Saigon 3 years later, after Nixon had resigned in disgrace for the real reason he won in a landslide. Which is what led to the myths about soldiers we spat on and didn't love enough. And now? As I said, I think the energy is with the outsiders, those who haven't had the power; at least haven't been the media darlings and "party leaders." Obama and Clinton are included in the latter, and even Reid. The "new kids," like Webb and Pelosi, and those with a conscience like Hagel, are on the cutting edge. Or, if you prefer, are on the crest of the wave. This book (sorry I can't get a bigger picture) made a bit of a splash 5 years ago, and then it sank beneath our wisdom like a stone. Not surprisingly, because it would seem to complete the effort Kierkegaard began 150 years earlier. He proclaim the end of 'Christendom.' Jenkins proclaims the end of "Western Christianity." And he's very likely right; and the current controversy in the Anglican Communion is very likely proof of his thesis. I pulled this off my shelf tonight, quite by accident. I'm going to be reading it over the next several days and, as I have a chance, I'll post on it. For now, the Atlantic article and the OUP summary will have to do. But it's worthwhile to realize Christianity was, for its first two millenia, a Western dominated concern (we don't even give much shift to the Russian and Greek Orthodoxies, much less to the Copts), and that is clearly shifting. One reason we don't see it is our cultural myopia, as Jenkins points out. The other is, the "Southern Christianity" he identifies is much more mystical, conservative, spiritual, and morally rigorous (i.e., "traditional") than the brand favored by Western Christians (such as you and me). We don't see it coming because we don't want to see it coming. But I think Jenkins is right. Coming it is. God is about to do a new thing, and it may not be centered on us this time. Kyrie Eleison. Christe eleison. Kyrie eleison. 4) The United States now has a strong economic influence in Nigeria through revenues from extracting oil along the delta regions of the country and elsewhere. Part of ++Akinola's Christian witness is to stand in opposition to Western hegemony that is propping up corruption and, at times, abusing the land and poorest people of Nigeria. When the Episcopal Church conscientiously acts to follow the call of of the Gospel in our own context, but breaks the faith as Nigerian Anglicans have received and transmitted it, there is not only a question of theological truth at stake, but further reason to be suspicious of a church enmeshed in a (perceived?) de facto imperialist economic power. Through this post- and neo-colonial lens, I begin to understand why Archbishop Akinola behaves as he does towards The Episcopal Church and the Archbishop of Canterbury. This is not to say I agree with his theological stands or approach to discourse, as I have posted elsewhere, but I at least begin to glimpse some of the realities on the ground that may motivate his recent words and actions around the current mess. Oil fouls everything in southern Nigeria. It spills from the pipelines, poisoning soil and water. It stains the hands of politicians and generals, who siphon off its profits. It taints the ambitions of the young, who will try anything to scoop up a share of the liquid riches—fire a gun, sabotage a pipeline, kidnap a foreigner. Nigeria had all the makings of an uplifting tale: poor African nation blessed with enormous sudden wealth. Visions of prosperity rose with the same force as the oil that first gushed from the Niger Delta's marshy ground in 1956. The world market craved delta crude, a "sweet," low-sulfur liquid called Bonny Light, easily refined into gasoline and diesel. By the mid-1970s, Nigeria had joined OPEC (Organization of Petroleum Exporting Countries), and the government's budget bulged with petrodollars. Everything looked possible—but everything went wrong. Dense, garbage-heaped slums stretch for miles. Choking black smoke from an open-air slaughterhouse rolls over housetops. Streets are cratered with potholes and ruts. Vicious gangs roam school grounds. Peddlers and beggars rush up to vehicles stalled in gas lines. This is Port Harcourt, Nigeria's oil hub, capital of Rivers state, smack-dab in the middle of oil reserves bigger than the United States' and Mexico's combined. Port Harcourt should gleam; instead, it rots. Beyond the city, within the labyrinth of creeks, rivers, and pipeline channels that vein the delta—one of the world's largest wetlands—exists a netherworld. Villages and towns cling to the banks, little more than heaps of mud-walled huts and rusty shacks. Groups of hungry, half-naked children and sullen, idle adults wander dirt paths. There is no electricity, no clean water, no medicine, no schools. Fishing nets hang dry; dugout canoes sit unused on muddy banks. Decades of oil spills, acid rain from gas flares, and the stripping away of mangroves for pipelines have killed off fish. Nigeria has been subverted by the very thing that gave it promise—oil, which accounts for 95 percent of the country's export earnings and 80 percent of its revenue. In 1960, agricultural products such as palm oil and cacao beans made up nearly all Nigeria's exports; today, they barely register as trade items, and Africa's most populous country, with 130 million people, has gone from being self-sufficient in food to importing more than it produces. Because its refineries are constantly breaking down, oil-rich Nigeria must also import the bulk of its fuel. But even then, gas stations are often closed for want of supply. A recent United Nations report shows that in quality of life, Nigeria rates below all other major oil nations, from Libya to Indonesia. Its annual per capita income of $1,400 is less than that of Senegal, which exports mainly fish and nuts. The World Bank categorizes Nigeria as a "fragile state," beset by risk of armed conflict, epidemic disease, and failed governance. Read the entire article, whether you care about The Episcopal Church or not. The Anglican Communion isn't even mentioned in the article, but if you want a better understanding of what oil production is doing in the world, this article is a good starting point. HARRIET WASHINGTON: Right, the early years, it was quite chilling. First of all, it's important to understand that there was a scientific animus called “scientific racism,” which at that time was simply science, and it posited that black people were very, very different from whites, medically and biologically. And this provided a rationale and an underpinning not only for the institution of slavery -- slavery probably could not have persisted if there hadn’t been this medical underpinning -- but also for the use of blacks in research. It's a cheap shot, and hardly a complete answer, but the next time some Dawkins/Harris disciple tells me that religion is the chief cause of woe in the world, I will be tempted to point this out, and remind them that the abolition movement in America started in the Christian churches. Nothing is ever so simple as to be (pardon the pun) "black and white". Five years ago this week, a one-hundred-twelve car train derailed just outside Minot, North Dakota - the state’s fourth largest city. The accident occurred shortly before two in the morning on January 18, 2002. Minutes later, the train’s conductor called the local emergency dispatch. Two hundred forty thousand gallons of anhydrous ammonia leaked out of the train producing a vapor plume that floated over the town. Limited exposure burns the eyes, the skin, and the lungs. Larger doses can shut down the human respiratory system. The chemical leak in Minot, North Dakota ended up killing one person and hospitalizing hundreds. But questions remain to this day over how the crisis was handled and the role played by media consolidation. The radio giant Clear Channel owned all six commercial stations in Minot, North Dakota. None of them broke into regular programming to provide emergency information to the city’s residents. After the town’s Emergency Alert System failed, local officials tried to call the stations - but no one answered. The stations continued to play music piped in from out of state. Listen to the audio on this one, especially the tapes of the 9/11 calls. If you aren't cursing the heartless bastards who made this accident worse, and who to this day continue to insist they weren't part of the problem, then you need to check the state of your soul. This story is also good, and enlightening on the issue of immigration and New Orleans. Until the transcript is up, you'll simply have to listen, or rely on my paraphrase. It seems that most of the reconstruction of New Orleans (such as is being done) is being done under the aegis of "H1B" visas, the "quest worker" program the President touted on Tuesday night. The first issue, of course, is: why are companies recruiting construction workers from out of the country, when there are so many unemployed people forced out of New Orleans who would gladly relocate for the chance to work? The answer, of course, is: $$$$$. First, "guest workers" can only get jobs in New Orleans by paying recruiting firms who advertise the jobs in their home countries. This gets them the visa, too, which makes them "legal." But they are only legal for 9 months or so, not until the work is done. And while they are here, they are paid whatever the company wants to pay: from $9 an hour to just above minimum wage, depending apparently on what country you are from. But then, you owe the company money (for charges they make sure you incure), and by the time your visa has expired, you're sent back home, or you're unemployed, and you're in debt. It is, as the report notes, the "new slavery." And it is precisely why these are jobs Americans don't want; and corporations do. Bill Moyers spoke recently of the "ownership class which has arranged the world for it's own benefit." Such societies never last; but owners continue to live as if their ownership and power were eternal. When will they ever learn? giving them no wage for their labour! Did not this show he knew me?, says the Lord. "A way of happening, a mouth"
The United States ambassador to Canada yesterday scolded Stockwell Day, the Public Security Minister, for insisting that Maher Arar be taken off a U.S. security watch list, fuelling a rift between Washington and Ottawa over the case. Ambassador David Wilkins told reporters in Edmonton the decision to keep Mr. Arar's name on Washington's "no fly" list was none of the Canadian government's business. "With all due respect to Minister Day ? it's a little presumptuous for him to say who the U.S. can and cannot allow into our country," the ambassador said after a meeting with Ed Stelmach, the Alberta Premier. "Canadian officials would rightly never tolerate any American official dictating to them who they may or may not allow into their country. What the US doesn't respect, apparently, is the Canadian government, or any obligation to apologize to Mr. Arar. Instead, the gov't stonewalls and insists they had good reason for...well, not for sending him to be tortured in Syria, but for denying him free access to America ever again. Maybe because we sent him to be tortured in Syria, and are now afraid he's pissed off. Who knows? Liberal MP Dan McTeague said the ambassador's comments were "almost unprecedented." Mr. McTeague called on Stephen Harper, the Prime Minister, to get involved directly in the case to convince the Americans to change their minds. "The Prime Minister should stand up for his Minister and stand up for Mr. Arar ... this is an issue that transcends partisanship," he said. "It's the least they can do, frankly, for Mr. Arar." He added if the Americans continue to insist on keeping Mr. Arar on their security list it could damage relations with Canada. "We're just asking the Americans to right a wrong," Mr. McTeague said. "We're not questioning their sovereignty." "This has implications that transcend the individual case ... this is a friendly country, an ally in the war on terrorism, making a perfectly reasonable request. It's inconceivable to me why the Americans are refusing to even consider this." Jumah al-Dossari, originally from Bahrain, was seized by Pakistani security forces in late 2001 and turned over to the United States. The U.S. military brought him to the Guantánamo Bay detention facility in Cuba, where, he claims, he was beaten, his life was threatened, and he was isolated from other prisoners for long stretches of time. Dossari, who denies any connection to Al Qaeda or terrorism, and has never been charged with any such crime, has repeatedly attempted to commit suicide while imprisoned. His most recent attempt, according to Amnesty International, was in March 2006, when he tried to slit his throat. That poem will be included in a collection of poetry by Guantánamo detainees that is being assembled by Marc Falkoff, a law professor at Northern Illinois University and an attorney for seventeen clients at the prison camp. Poems from Guantánamo: The Detainees Speak will be published this fall by the University of Iowa Press and will include essays by several prominent literary and cultural figures. Most of the poems were written in Arabic and translated by non-professionals. Falkoff won't be able to include all of the works he had hoped to, because the Pentagon has classified some of the poems. In a September 18, 2006 memo, a Pentagon official explained that several poems submitted for declassification had been rejected because poetry “presents a special risk” due to its “content and format.” It was not made clear whether the Pentagon believes the danger lies in the power of words or in the risk that detainees could send coded messages to terrorist operatives through their poems. “As much as I'd like to think it's the former, I presume it's the latter,” Falkoff replied when I asked him about the military's thinking on the matter. Yourself; mad Ireland hurt you into poetry. A way of happening, a mouth. CHENEY: That we don't have the stomach for the fight. That's the biggest threat. [Former Guantanamo prisoner] Dost's brother, Badruzzaman Badr, was also detained at Guantanamo and later freed (his work, too, will appear in the collection). Both men returned to their home in Peshawar, Pakistan, and last September published The Broken Shackles of Guantanamo, which describes their experiences there. The book is also critical of the ISI, Pakistan's intelligence agency, and its collaboration with the United States in the “war on terror.” On September 29 of last year, Dost was arrested as he left a local mosque; he has thus far not been charged but has been prevented from seeing an attorney or his family. His brother has reportedly gone into hiding. Perhaps poetry makes something happen after all. so few places to read them. Thankfully, there is always room for one more. More thankfully, there is another place to enjoy them. Grandmere Mimi is on-line. And while it's not a blog, well, neither is she a Wounded Bird. Ronnie Tallman comes from a long line of Navajo spiritual leaders, but there also were soldiers among his kin. At the age of 19, he decided to follow in the footsteps of the soldiers, joining the Marines in October 2004. Now he believes it was the wrong path, that his destiny lies in healing, not fighting. The Navajo Nation and an organization of medicine men agree. The Marines do not, and now a federal court must decide a case that pits the spiritual beliefs of the Navajo against United States military rules. It started in November 2005 while Tallman was on weekend leave on the Navajo Reservation in Arizona. There, he says, he underwent a spiritual experience and discovered he had been given the gift of a sacred entity known as teehn leii, a rare form of spiritual diagnosing and healing celebrated among Navajos. Tallman is a hand trembler. While a simple definition is clouded in the translation from Navajo, hand tremblers are rare medicine men who can sense people's problems and illnesses and often restore physical, mental and spiritual well-being. Because Navajo spiritual law holds that Tallman cannot keep the power and serve his people if he participates in killing, for almost three months he didn't rejoin Delta Company of the 3rd Assault Amphibian Battalion stationed at Twentynine Palms, Calif. When he did, he applied for conscientious-objector status. Over the course of a year, Tallman's application garnered recommendations of approval from the Christian chaplain and investigating officer who interviewed him to the battalion commander and assistant commander of the 1st Marine Division. Three psychiatric evaluations found, for varying reasons, that Tallman should be discharged. Then, on Jan. 13, Tallman learned his application failed. His only recourse to deployment in Iraq is a review by a federal court. The Marines don't simply want you to use weapons, Tallman said in his application; the Corps teaches you "to want to kill people and to think that killing is a good thing." He was not ready, he said, to sing songs and join chants about killing people. The Dine Hataalii Association, an organization of medicine men recognized by the Navajo Nation, has licensed Tallman as a hand-trembler diagnostician. The process includes being tested by an enrolled member of the association to see if the applicant sees what the member sees, Tallman says. Then, the applicant goes before a board and is sanctified by another trembler in a ceremony that includes traditional songs and prayers. Navajo Nation President Joe Shirley Jr. wrote a letter urging Tallman's discharge because "our gifted medicine people are small in numbers." Religion, you know, is the real danger in this world. Two blocks from the new American outpost in Ghazaliya, one of Baghdad’s most dangerous neighborhoods, a fight was raging. Shiites were battling Sunnis, the latest skirmish in a sectarian war that has left this area a wasteland. On Friday morning, it became an American fight, too, after a few rounds whizzed by Sgt. Sergej Michaud’s head, and he and three other soldiers returned fire. The battle would rage for nearly an hour, with mortar shells and rocket-propelled grenades exploding near the soldiers, who in turn laid down heavy fire, eventually driving the attackers away. Previously, that would have been the end of it, with the soldiers moving on to their next patrol area and eventually returning to their base. But this time, the Americans were staying, defending their new home in a neighborhood where the rule of law had been driven out by the reign of the gun. Their outpost here, a cluster of fortified houses officially designated a joint security station and unofficially called the Alamo by some of the soldiers, is a test case for President Bush’s new Baghdad security plan. The strategy envisions at least 20 more facilities like it in other troubled neighborhoods, all jointly staffed by Iraqi and American forces. This is the only answer we have in Iraq: the rule of law has been replaced by the reign of the gun (and who started that, hmmmm?). Now we, the "good guys," will restore the rule of law by...the reign of the gun. Presumably the bigger gun. Should I remind the soldiers that the Alamo was a failure and a slaughterhouse, in a fight for the right to own slaves? No, perhaps not. As residents began arriving to offer information, a man who lived next to the new station, a Sunni and former police commander, loaded his family’s possessions into a pickup truck. The man explained that both the Mahdi Army and Al Qaeda were sending spies to see who was feeding the Americans information. The boy slipped away. At the same time, Iraqi Army soldiers were starting to move into the outpost. They arrived in the late afternoon, one truck with a flat tire towing another truck that was not working. Maj. Chasib Kattab, a boisterous Shiite who commands the Iraqi unit of two companies, about 200 men, started to provide information. But, in a likely hint of things to come, all his tips involved Sunni fighters. He had nothing to say about the Shiite militias. He also seemed eager to fight. When he told the Americans about a car that was likely to be used as a bomb, he asked whether American helicopters would be able to destroy it. Told that, at night, they could make out the shape but not the color, Major Chasib seemed to think that was good enough. “They should just shoot it,” he said. Captain Peterson had to explain that was not how things worked, aware that his partner’s decisions would affect how the Americans would be perceived. As Corporal Callahan, a US medic, says: “The adults, they are going to do what they are going to do.” Even 5 year olds know that. But this is worse than if 5 year olds were in charge. This is blind stupidity pretending to be policy. The "surge" in 25 words or less. His and others' advocacy for the homeless paid off when de Villepin this month sent a bill to parliament that will establish housing as a right and enable the homeless to sue the state for lodging. Fondation Abbe Pierre, another non-profit group he founded to work with the homeless, estimated last year that France has 100,000 homeless, up from 86,000 in 2001. In April 1939, his life changed dramatically, as he was sent from the quiet religious community to the bustling city of Grenoble to work as parish priest. Within a few months, war broke out and France was invaded by Germany. The young priest joined the Resistance and was soon making forged identity papers and work permits and helping to smuggle Jewish people out of the country to Switzerland. In 1943, he met resistance worker Lucie Coutaz, who was later to to become involved with the Emmaus community. It was during this time that Fr Henri was given the code name 'Abbé Pierre' which he has kept ever since. That name was on the Gestapo's wanted list. On several occasions his life was in great danger. In 1944 Abbé Pierre escaped to Spain and joined the Free French forces in Algiers where he worked for a time as a Navy chaplain. When the war ended, the Abbé returned to France and in October 1945, General De Gaulle persuaded him to stand for parliament. He won the election as an independent candidate allied to the socialists. The war had left many people in France desperately poor. To begin with, the Abbé simply opened his own presbytery to homeless people who he found on the streets. He had planned to make his large, dilapidated house in the Paris suburb of Neuilly Plaisance, into a student hostel, fostering reconciliation among Europe's post-war generation. But very soon 18 homeless men had moved in. The Abbé spent his whole salary, buying war-surplus materials for them to put up temporary homes, first in his own large garden. One of the men was a homeless ex-convict called George, who had planned to commit suicide. George was to became one of the founder members of Emmaus. Soon more homes were established and gradually these communities, whose members became known as 'Les Chiffonniers d' Emmaus' (the rag pickers of Emmaus), took on a dynamic of their own as the 'companions' and showed they could support themselves by using skills learned while they had been living on the streets. By recycling, refurbishing and re-cycling other people's rubbish - glass, paper, cloth and metals, the Communities were eventually able to make enough income to support themselves. Snarky comparisons to "mega-churches" would be entirely inappropriate. How many of us, after all, want to be "the rag pickers of Emmaus." But how does this sound anything like the "Christians" pilloried by Sam Harris or Richard Dawkins? One issue the Abbé Pierre, and other groups, such as 'Droit au Logement' were angry about, was the fact that, while hundreds of apartments were vacant in Paris, and most other large French cities, thousands of families did not have decent living conditions. Either they were on the streets or living in overcrowded slums. To make the point, Abbé Pierre went to Paris and took over an empty building in Rue Du Dragon. Jacques Chirac, who was Paris's mayor at the time, was compelled to react, as was Balladur, the French Prime Minister. But they both gave in to the pressure exerted by Abbé Pierre, possibly because they realized it would have meant political suicide to ignore him. From that point on, Chirac promised to requisition empty buildings in accordance with an old 1945 law. One last thing: I have to investigate this further, but at this point I don't find any Emmaus Community connected to Abbe Pierre's organization extant in the US; not via Google of the Emmaus International website. This is not politically "good" or "bad," but it certainly strikes me as sad. Still, I'm glad to know it exists somewhere in the world. White House officials say Mr. Bush has decided to forgo the traditional formula for the State of the Union — a laundry list of ideas, many of them dead on arrival — in favor of a more thematic speech that will concentrate on a few issues, like health care, immigration and energy, on which he hopes to make gains with the new Democrat-controlled Congress. The basic concept is that employer-provided health insurance, now treated as a fringe benefit exempt from taxation, would no longer be entirely tax-free. Workers could be taxed if their coverage exceeded limits set by the government. But the government would also offer a new tax deduction for people buying health insurance on their own. My income (with my lovely wife's) is "low" enough that we regularly receive a nice tax refund every year. This has not always been true in our long marriage, but I've come to expect by now. It's a nice piece of change, living as we do, but in no way would it make up for buying decent healt care coverage. In fact, we do that now, through her employer, and it takes away more from our monthly income than the tax refund puts back. Would making the tax refund larger make us more likely to buy health insurance? No. The high cost of medical care (and the fact I'd have to go to the county hospital for treatment without insurance) makes us pay the premiums. But even those aren't so large, because we get it through the lovely wife's employer. Without that option, I couldn't buy health insurance at all, even if my federal taxes were reduced to zero. It's an idiot's argument: that what keeps me from buying health insurance is my federal tax burden. Actually, if it was any tax burden, it would be my property taxes, which exceed my mortgage payment by a significant percentage. But low income workers don't do without health insurance because they have to pay taxes. They do without health insurance because they have to eat, have shelter, and buy clothes. And then there's the whole problem of taxing those with insurance, which simply makes no sense at all. "But strive for the greater gifts"
12:12 For just as the body is one and has many members, and all the members of the body, though many, are one body, so it is with Christ. 12:13 For in the one Spirit we were all baptized into one body--Jews or Greeks, slaves or free--and we were all made to drink of one Spirit. 12:14 Indeed, the body does not consist of one member but of many. 12:15 If the foot would say, "Because I am not a hand, I do not belong to the body," that would not make it any less a part of the body. 12:16 And if the ear would say, "Because I am not an eye, I do not belong to the body," that would not make it any less a part of the body. 12:17 If the whole body were an eye, where would the hearing be? If the whole body were hearing, where would the sense of smell be? 12:18 But as it is, God arranged the members in the body, each one of them, as he chose. 12:19 If all were a single member, where would the body be? 12:20 As it is, there are many members, yet one body. 12:21 The eye cannot say to the hand, "I have no need of you," nor again the head to the feet, "I have no need of you." 12:25 that there may be no dissension within the body, but the members may have the same care for one another. 12:26 If one member suffers, all suffer together with it; if one member is honored, all rejoice together with it. 12:27 Now you are the body of Christ and individually members of it. 12:28 And God has appointed in the church first apostles, second prophets, third teachers; then deeds of power, then gifts of healing, forms of assistance, forms of leadership, various kinds of tongues. 12:29 Are all apostles? Are all prophets? Are all teachers? Do all work miracles? 12:30 Do all possess gifts of healing? Do all speak in tongues? Do all interpret? 12:31 But strive for the greater gifts. So can one congregation of TEC say "I do not belong to the body," and be any less of the body? By the same token, because the eye sees, has it purchased the right to be a body unto itself? Because the mouth eats, has it, through countless meals, purchased superiority to the hand? The foot that carries the body has paid the price of transportation; has it bought rights against the head? You can see where this is going. What is more valuable? Independence? Or interdependence? Do we find the truth of God in our own convictions? Or in the struggles with a community that doesn't always agree with us, that sometimes, like God, forces us to change our minds, our practices, our behavior? Who is striving for the greater gifts?